A Year Through The Lens: Day 95 – Morning view. When you arrive at a destination at night it’s hard to get your bearings, as of course stating the obvious its dark outside. Lights only offer so much, well, light on the matter. So when you open the curtains to your room on the 19th floor and look out it is a very pleasant surprise. 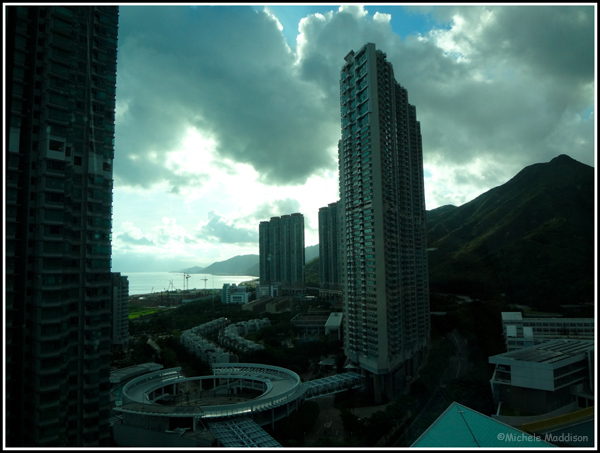 Mountains to the right, filtered harbour views through one of the many high rises in Hong Kong, life is cool. It is an amazing city Hong Kong and can’t wait to get back in two weeks to explore it further, and stay on the island. Although I have to say this hotel near the airport is pretty special and the chairlift with the glass bottoms, for a different view up to the big Buddha is only just over the road.